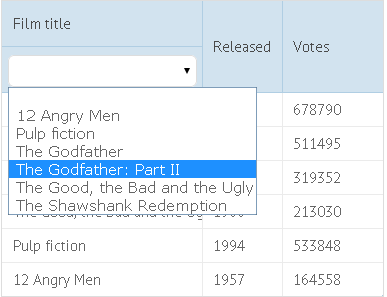 The library provides ability to filter data on the client side by one or several criteria using built-in or custom filters. All of them are described in detail below. A built-in filter is set by the content property of the header/footer attribute. Note that to add a filter to the header (footer), the header (footer) must be specified as an array. If you need to create a custom filter (or something) for header content, or you need to redefine the behavior of an already existing filter, go here for the instructions. This functionality is available for Pro filters only. 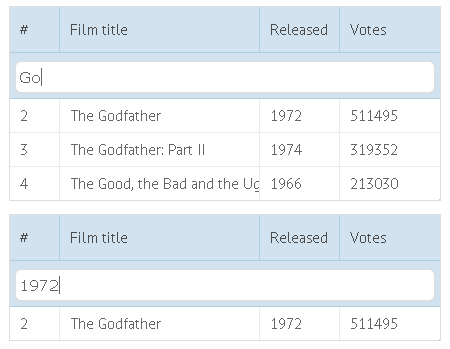 You can configure the input that is used in the table's header for filtering - richselect, datepicker, etc. For this purpose, you need to use the inputConfig property. from collection/options of the filter. 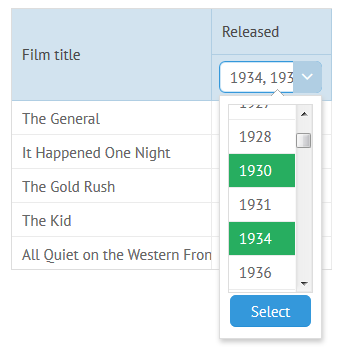 You can set collection/options in several ways just like for columns, and regardless of the way the options will be stored in a DataCollection. Retrieves values that contain mask defined through text field. A text filter that works with backend. Retrieves values that contain mask defined through text field and sends a request to server to return filtered dataset. filter[column_name] - name of the column (in brackets) for which filtering is performed. Its value is a text value you've entered in the filter input. If server-side sorting is enabled, data is both filtered and sorted on server. Retrieves values that contain mask defined through a dropdown list of possible values. Based on a standard HTML select input. A select filter that works with backend. Retrieves values defined through a dropdown list of possible values and sends a request to server to return filtered dataset. filter[column_name] - name of the column (in brackets) for which filtering is performed. Its value is a text value you've selected in the filter input. '>=' - greater or equal. Available in Webix Pro edition only. Retrieves values that contain mask defined through a popup list of possible values. Based on Webix richselect control. Retrieves values that contain mask defined through a popup list of possible values. Sends a request to a server to return a filtered dataset. If server-side sorting is enabled, data is both filtered and sorted on a server. 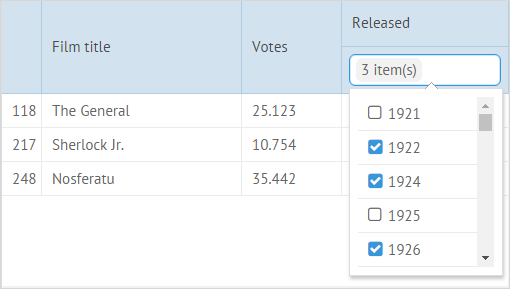 Retrieves values that contain mask defined through a popup list of possible values while multiple values can be selected at once. Based on Webix multiselect control. Retrieves values that contain mask defined through a popup list of possible values while multiple values can be selected at once. Sends a request to a server to return a filtered dataset. Retrieves values that contain mask defined through a popup list of possible values while multiple values can be selected at once. Based on Webix multicombo control. By default, the tagMode configuration property for this filter is disabled, i.e. the control shows only the number of the selected options. 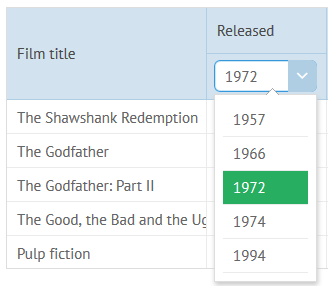 Compares the entered value with values in a column and retrieves exact matches (works with Date objects only). 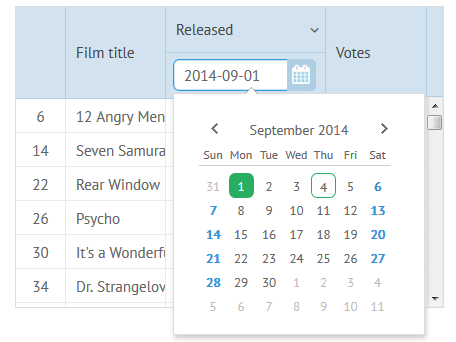 Based on the Webix DatePicker control. 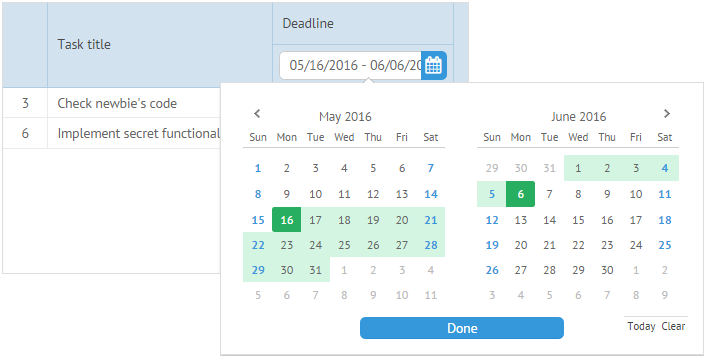 Retrieves values that contain mask defined through the range defined in the popup calendar. Based on Webix daterangepicker control. A daterange filter that works with backend. Retrieves values defined through the range set in the popup calendar and sends a request to a server to return a filtered dataset. filter[column_name] - name of the column (in brackets) for which filtering is performed. Its value is a JSON string formed out of the value you have entered in the daterange picker. Note that each time you start to type text in such a filter, DataTable invokes the filterByAll method. Each time the method is called, all data is re-filtered (previous results aren't preserved). By default, when you specify filters in several columns, DataTable applies AND logic to them, i.e. the table will display only the records that meet all criteria at once. You can modify the default filtering pattern by creating a custom function and setting the compare property of the header(footer) attribute to this function. filterValue - the value entered in the filter. filterObject - the object of the filter. 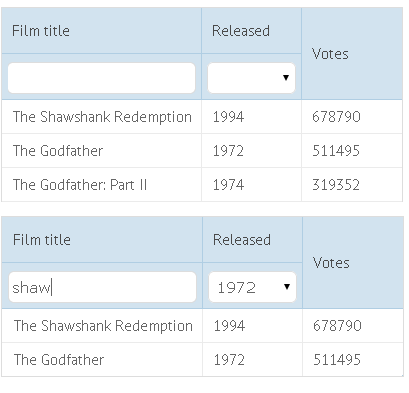 There is a possibility to filter DataTable by different columns using one input for this. Specifying an additional filtering rule. In addition, the library gives you the [filter()](api/link/ui.datatable_filter.md) method to provide fully custom filtering. Note, in the DataTable constructor you need to specify no parameters. Datatable API allows searching for the needed records easily with the help of its find method. Unlike filtering, it preserves the records visible but returns an array of rows that match the given criterion for further usage. In case of TreeTable some extra configurations can be defined to define how filters will be applied. showSubItems - (boolean) defines whether the tree must display children of the filtered items (true) or the filtered items would be displayed as children of the root node (false). The default value - true. openParents - (boolean) defines whether the tree will expand branches to show the found items (true) or stay as is (false). The default value is true.